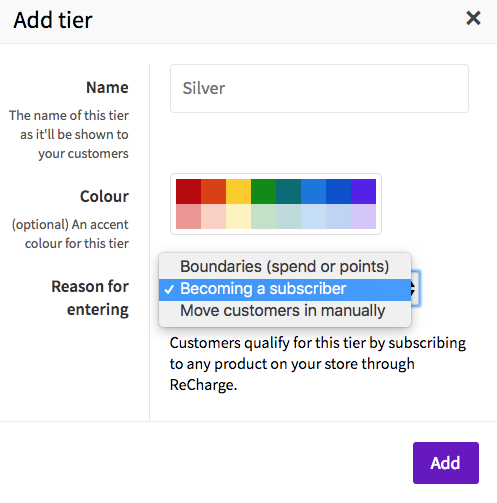 Subscriber Tiers are an exclusive type of loyalty tier that can only be accessed by customers who subscribe to a product on your store and continue their subscription. You can design this tier so customers who become subscribers gain exclusive access to rewards and/or are given more points for certain activities, for example, twice the amount for purchasing. Why would I want to create a subscriber tier? Subscriber Tiers will incentivise more customers to subscribe to products on your store, which in turn increases their lifetime value and therefore your profit. If you have never set up any tiers follow the steps below. If you already have some tiers in place, contact us here. Step 1: Turn on the ReCharge integration on your manage integrations, within LoyaltyLion. Remember to add all the tiers you want at once - once you've launched them you can't add or remove tiers yourself. If you want to reset your tiers email us at support@loyaltylion.com and we will be able to help you.3. Continue to follow the walkthrough. Chose how many points you want to give to each Tier for each activity. SuccessTip: Remember to give your customers an incentive to become subscribers by giving more points for activities and reducing the cost of rewards. Success Tip: Set up lower amount of points needed to be redeemed for Rewards and set up exclusive Rewards for Subscriber Tier - give your customers reasons to want to be in that Tier. Free Product voucher if I'm a subscriber? Yes please! Customers in other tiers will be moved to the subscriber tier as soon as they subscribe - so if someone is in your top tier you want them to gain better rewards for subscribing, not the other way round. They will automatically be moved out of the subscriber tier into the best tier they qualify for. With a subscriber tier, if a customer has spent $80 in the past twelve months and stops subscribing, they will be moved into the Mid Tier. My subscription customers aren't in the right tier, why? ReCharge may take a while to tag new subscriber customers. So if your new subscriber customers don't move into the right tier straight away, check again in 24 hours as they probably will have done then.